Surprising, refreshing and beautiful… this Indian dessert is perfect for a hot, sweltering summer. Though the result is exotic, the ingredients are not and most are easy to find at your local grocery store. I tasted this dessert for the first time at a party in the home of my husband’s Indian colleague and was immediately taken by the delicate taste and texture. I had forgotten this discovery until a roundabout google search for a Thai soup recipe inexplicably landed me on a Rasgulla recipe. Click, click, click… I was getting into trouble quickly learning various techniques. And in under an hour I had my first successful batch cooling in the fridge. I had already made ricotta cheese at home, so making paneer for the first half of this recipe was easy – it’s the exact same process with slightly different ingredients and timing! In the sink, prepare a strainer with a rinsed wet cheesecloth draped over the sides. In a large regular pot, or the pressure cooker with no lid on medium heat, bring the milk to a boil. When it begins to foam and bubble add the lemon juice. Stir slowly until the curds and whey separate - it will look like a semi-transparent liquid with white globs floating in it. Turn off the heat and pour the curds into the cheesecloth (if you like, you can do this step over a bowl to save the whey to use later - I add it to my focaccia dough. Next, run cold water over the whey and move it around with your hands to rinse off all of the lemon juice. Pull up the sides of the cheesecloth, twist, lightly squeeze and hang the cloth from the tap of your kitchen sink (rubber bands and twist-ties may come in handy here) or just drape the bag in the colander. Prepare your pressure cooker with the water and sugar, with the top off on medium heat, bring it slowly to a boil while you quickly work on the next steps. Either knead the Paneer, like a dough, 7-10 minutes or break it up in chunks and put it in a food processor and pulse few times and blend to get a smooth dough (about 45 seconds total). Separate the dough into small almond-sized pieces and roll into little balls. 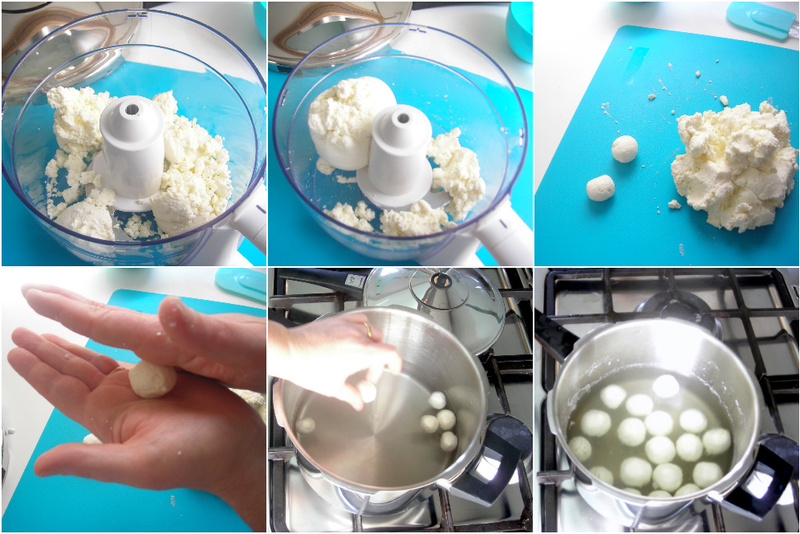 Work quickly because if the Paneer balls wait too long to be cooked they may not "puff up" when they are pressure cooked. When all the balls are made drop them in one at a time into the boiling sugar water in the pressure cooker. Close and lock the lid. Turn the heat up high and when the pan reaches pressure, lower the heat and count 1 minute cooking time at LOW pressure. When time is up, turn off the the heat and let the pressure come down naturally for 5 minutes. After 5 minutes of waiting, release pressure slowly. Open the pressure cooker and with a deep spoon or small ladle scoop out the Rasgulla. You can either scoop them out with some of their sugar syrup for a light sweet, or make a new, more intense, sugar syrup (melt one cup of sugar into two cups of water) with the addition of rose water when it has cooled in which to submerge them Rasgulla while chilling. When cool enough, put in the refrigerator to chill for a couple of hours- they will further soften while in the refrigerator. Serve chilled with a little bit of the syrup and a pinch of ground nuts on top - about 3 Rasgulla balls per guest. what a beautiful dish. And your instruction is so detailed. Delicious sweet and very neatly explained. Thank you for a rasgulla recipe in the pressure cooker. We can’t wait to try it! This dish brings back fond memories for my Bengali husband. Anh and Reshmi, thanks for your comment and approval!! Maynekitty, please let me know how your husband liked it. Should we put the pressure regulator on the cooker ? Or just without it. Use the weight, or setting, that corresponds to Low pressure. Bring to pressure for just a minute, and then open with the cold-water quick or normal release. Thanks for such a wonderful recipe. I am planning to make these for Father’s Day since it is my father’s favorite dessert. Can you please tell me how many Rasgullas 1L of milk will produce? Thanks!